The NSF to EML Converter software provides 8+ preview to deeply analysis of scanned data. Software provides fully advance search option to deal with piles of nsf emails. Select NSF emails or files for export to eml. Select desired file format i.e. EML in destination. Apply filters & browse location to save result. Then click on OK to start the process. I am the director of a small company. There are around 40 employees are working in my company. I have configured the email client with 50 end users license. But from last week an unknown error has occurred when any user/employee deletes email from the Inbox. When user log on at 11 AM, and the error occurs at 4 PM. They are unable to attach any documents or attachments with emails. So I decide to go with other email clients with the complete set of data around 10 GB in the limited time span. Can I able to move my completed data to eml? Does software convert attachments to EML as well? How much time needed to convert 10GB of data? Is the integrity of data maintains after the conversion? Is Lotus Notes installation required for conversion? Does the nsf to eml converter support the archive file also? There are the certain circumstances which are unavoidable in nature and you cannot neglect or deny the overall impact of such situations. You have only option to deal with them or change your path. The same arises with email clients also and you do not have enough time to deal with them so you have to choose the other compulsively. But these are not the real problem. The problem arises in converting the one data format to other such as in above scenario. But you do not to panic because NSF to eml converter is there to solve your problem instantly. It is innovative and professionally built to deal with such kind of situation with ease. With the use of this tool, you can easily convert your complete data to EML with attachments as well while maintaining the integrity of data. There is no need of installation of lotus notes for conversion of nsf to eml. It also supports all kind of nsf files. Do I need to install and configure IBM notes to perform the conversion? Is there any file size restriction with this converter application? No there in no file size restriction for carrying out NSF to EML conversion. Users can convert any number of NSF files with this tool in one go. Can I convert the inaccessible NSF files using this tool? Yes, you can scan and preview the corrupted or inaccessible NSF files from lotus notes using this tool. Can I export selected emails from NSF to EML? I don't know the exact location of my NSF files. Does it automatically detects NSF form my system? 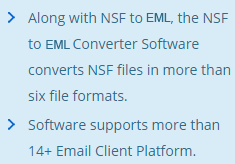 Yes, the NSF to EML Converter tool is smart enough to automatically detect the NSF from your system. To be frank, NSF to EML Converter Software is one of the best online solutionsthat I have used till date. This is completely a professional tool that migrates all the contents from NSF files to EML format. Excellent tool! NSF to EML Converter is an excellent tool that enabled me to scan and preview the emails NSF file. 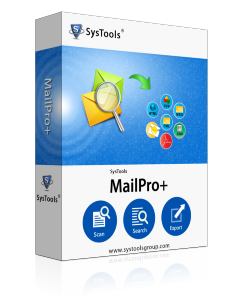 Moreover it helped me to search from the bulk of emails and selectively export to EML format. Thank you, guys for the excellent work. The user migrates or converts his data When the user wants to convert to email format which suited to his needs and ease.The email client which supports multiple cross-platform interoperability, better encryption and supports multiple accounts as well. This is the same case with Lotus Notes email client. It does not support multiple account configuration at the same time. You have to log out first to log in with the different email account. So to move with the complete data set you to have to convert your data to other file formats first. For this, you need the NSF to EML Converter.